How would you correct the sentences above that are wrong? Scroll down for the answers! 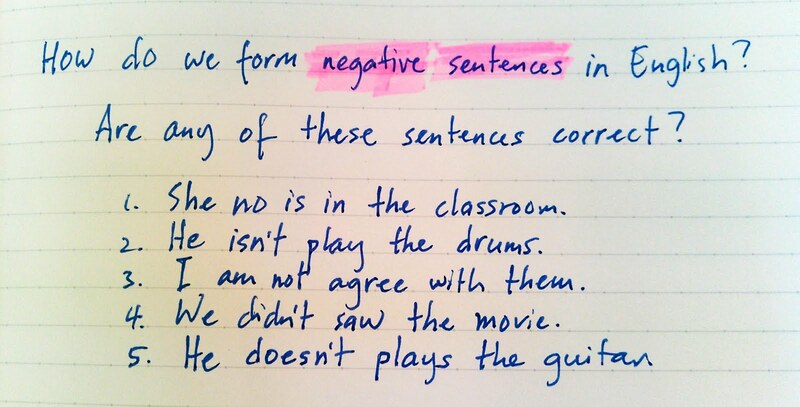 Forming negatives in English is not difficult. We just need to remember a couple of main rules. We almost always use an auxiliary verb, also known as a helping verb. We form the negative by adding "NOT" to the auxiliary verb. There are a few other things to consider, but they are all related to the two main rules above. First, we need to realize that some affirmative sentences already have auxiliary verbs. These sentences are usually sentences with the verb "BE" or with MODALS. They MIGHT fly to Madrid. 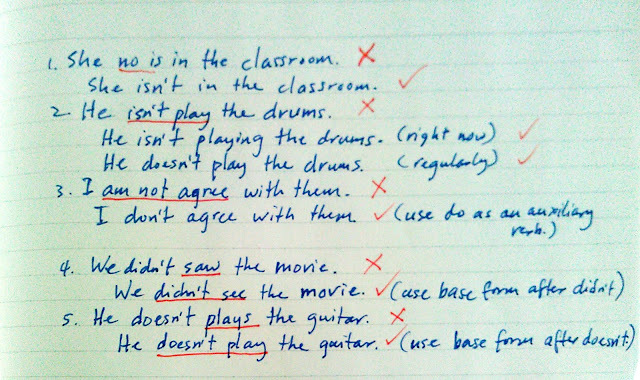 To form negative sentences with these verbs, simply add "NOT" after the auxiliary verb. They MIGHT NOT fly to Madrid. Note that the verb "BE" can also be the main and only verb in a sentence. In this situation, we also simply add "NOT" to form the negative. I AM tall. --> I AM NOT tall. They ARE from Austria. --> They ARE NOT from Austria. We also need to note that some tenses already have auxiliary verbs. The simple future tense uses "WILL," the present perfect uses "HAVE" or "HAS," and the past perfect uses "HAD." To form negatives sentences with these tenses, we also follow the second main rule and simply add "NOT" after the auxiliary. They HAVE been to Copenhagen. --> They HAVE NOT been to Copenhagen. We HAD heard of that song before she sang it last night. --> We HAD NOT heard of that song before she sang it. So remember, if there's already an auxiliary verb, simply add "NOT" after the auxiliary to form the negative. Another rule to remember is that when there is no auxiliary verb, we have to add one. This happens in simple present and simple past sentences. 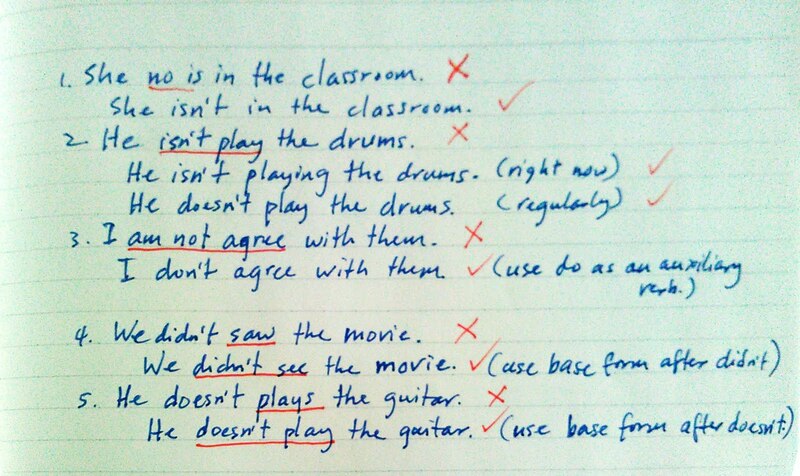 For these tenses, we add the correct tense of the verb "DO" as the auxiliary verb, then we add "NOT." The following sentences are in the simple present. She WASHES dishes. --> She DOES NOT WASH dishes. They RUN in the park. --> They DO NOT RUN in the park. The following sentences are in the simple past. He COOKED dinner. --> He DID NOT COOK dinner. She WASHED dishes. --> She DID NOT WASH dishes. They RAN in the park. --> They DID NOT RUN in the park. Third, remember that the main verb is always in the base form if you add the auxiliary verb DO, DOES, or DID. Yes, some English speakers don't use "do" when forming negatives with "have" as the main verb in the present tense. For example, when the affirmative sentences is "I have some money." Some will form the negative this way: "I haven't any money." or "I haven't got any money." These are possible. ADVICE: However, the most common way to form the negative for these sentence in the U.S. is to use the auxiliary "do" -- "I don't have any money." If you are still learning this rule, I would follow it and be consistent until you master it. QUIZ TIME! Now, it's time to practice. 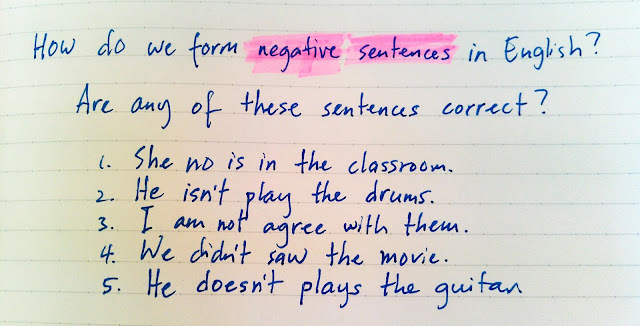 How would you change these affirmative sentences into negative sentences? The answers are below. No peeking! They are having an argument. They have an argument every weekend. He can buy her a new one. That's it, folks! If you remember these rules, you will be forming negative sentences correctly and with confidence. He goes to school. --> He DOESN'T GO to school. She studies economics. --> She DOESN'T STUDY economics. They had an argument. --> They DIDN'T HAVE an argument. They are having an argument. --> They ARE NOT HAVING an argument. They have an argument every weekend. --> They DON'T HAVE an argument every weekend. They have been married for 5 years. --> They HAVEN'T BEEN married for 5 years. It was raining. --> It WAS NOT RAINING. She forgot her umbrella. --> She DIDN'T FORGET her umbrella. She had a lot on her mind. --> She DIDN'T HAVE a lot on her mind. He can buy her a new one. --> He CANNOT BUY her a new one. How did you do? Any questions? Feel free to comment below.